Blazing Hot Wok: Regional Recipes Round-up #3: T'is the season for Thai food! 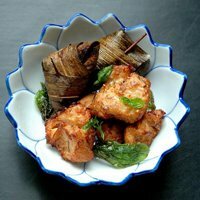 Regional Recipes Round-up #3: T'is the season for Thai food! I was really excited when Wandering Chopsticks picked Thailand for this round of Regional Recipes. People always say they love Thai food but confess they rarely make it at home, so I hoped this would encourage them to try. Even though I grew up eating Thai food, preparing it has been a learning process for me. Two reasons: 1) I grew up on Isaan food, which is a cuisine from the northeastern region of Thailand. It's nothing like the food found in most Thai restaurants here in the US, although I've seen more Isaan dishes being offered than in the past. 2) I wasn't very good at paying attention when mom cooked. It wasn't until I was married and living far from my parents that I realized I should have paid more attention. Luckily, I can call mom up whenever I need to and get tips and advice. Thai green curry is one of my favorite foods. It's the first thing I learned to make after I left my mom's house. It took many (many!) tries, but I think it's almost as good as mom's. Almost. You certainly don't have to grow up eating Thai food to be good at preparing it. You just have to practice. Sure some of the ingredients can be hard to find, but why not start simple? Hells, at my local Safeway, I can find fish sauce, coconut milk, curry pastes, lemongrass, fresh mint and peanut sauce. With these basic ingredients, you could bang out half of the submissions in this round of Regional Recipes! Of course, I encourage you to visit your local Asian market for a larger selection. Most big cities have supermarkets that sell ingredients from several SE Asian countries, so you're sure to find fresh Thai herbs and sauces. For the basic Thai pantry I recommend red and green curry pastes, fish sauce, naam prik pao, Thai oyster sauce, palm sugar, coconut milk, tamarind paste (or block, my preference) and thin soy sauce. If you live away from a major city, then the Internet is probably your best bet. 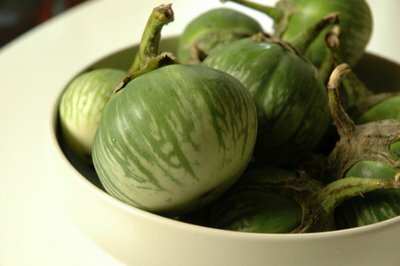 Thai eggplant is usually available at Asian markets that sell SE Asian ingredients. Thai food is highly aromatic due to the use of fresh herbs. You'll have to visit a store that sells SE Asian herbs, but it's well worth the visit. I recommend you pick up kaffir lime leaves (can be used in place of the zest), galangal, lemongrass, chili and Thai basil (there are 2 varieties, but the sweet basil is usually what's available). If you're worried about the perishability of the herbs, I wrote a post on how to store them. The only one you won't be able to keep more than a few days is the basil. It has to be used fresh. I highly recommend getting yourself a large mortar for making spice pastes and som tom. Mom gave me this one years ago. Enough rambling. Shall we get on to the submissions? Gai Hor Bai Toey (chicken in pandan leaves) from Thip of Bonbini! Pandan is a wonderful flavor often used in Thai desserts. As Thip says, pandan is as important to Asians as vanilla is to Westerners. It can also be used in savory dishes. Unfortunately it can be difficult to find, and that's probably why this dish isn't seen more in Thai restaurants in the US. Too bad really, because this chicken is awesome! 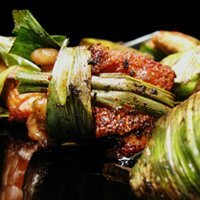 It's marinated overnight in a flavorful mix, steamed in the leaves and finally fried to a golden color. The picture speaks for itself! 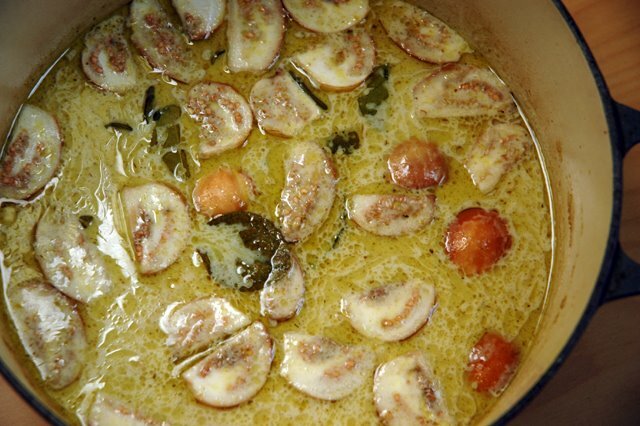 There are two dishes that bring back memories of home. The first is green curry and the second is laab. This "meat" salad is the perfect example of Isaan-style Thai food. 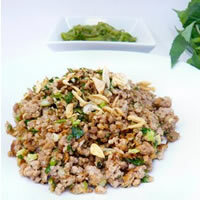 The basic ingredients include ground meat, mint, lime, chili, fish sauce and toasted rice powder. 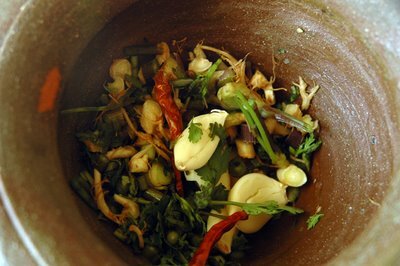 Other herbs, such as cilantro, lemongrass, kaffir lime leaves, scallions and garlic can be added to taste. 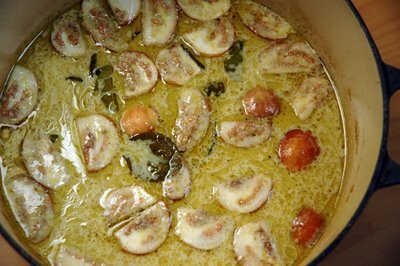 It's really quite simple, but yet so flavorful. People must agree, because I got two submissions for this dish. Laap from Kits Chow. KC has used ground pork and added kaffir lime leaves, cilantro and shallots. 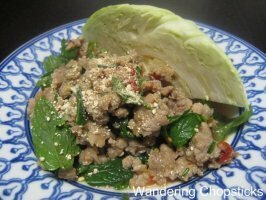 Larb from Wandering Chopsticks. Here WC has used ground turkey and garlic in the sauce. The crunchy, sweet cabbage leaves are a perfect textural and flavor accompaniment for this salad. I also like it with Thai sticky rice. Pla phad phrik khing from Mark of No Special Effects. Red curry is a must in any Thai pantry. Not only is it used in the popular Thai red curry, but as a main seasoning component in a wide variety of dishes. Here it's used to spice up fried fish and green beans, and I can tell you this is a wonderful combination. Gai Hor Bai Toey (chicken in pandan leaves) also from No Special Effects. Mark's on a roll! He also made chicken in pandan leaves. His version is a little different from Thip's, but I'm positive it's just as tasty. I mean, just look at it! And not a bad wrapping job for a first timer :-). 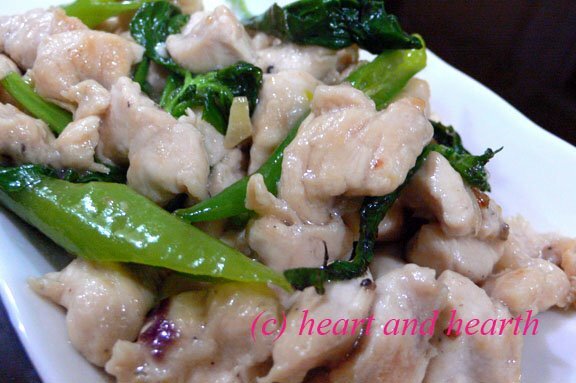 Gai pad grapow (Thai chicken and basil stir-fry) from Heart and Hearth. Whenever I go out to eat with people who are unfamiliar with Thai food (are there any left?? ), I always recommend this dish. It can be as spicy or as mild as you like and the Thai basil just shines. It also turns out to be quite simple to make at home with very little fuss. I guarantee it will be a hit! Boo-jah (crab cakes) from Mary of One Perfect Bite. It's crab season and what better way to use fresh crab than to make these crab cakes? 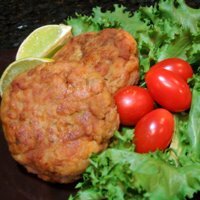 These tasty treats are made with crab and pork seasoned with cilantro and garlic. Served with a spicy dipping sauce, they make the perfect appetizer for any holiday get together. 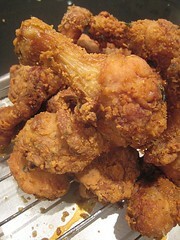 Thai fried chicken from [eating club] Vancouver. Colonel Sanders has got nothing on this chicken! It's marinated in garlic, cilantro, oyster sauce and fish sauce then fried to a golden crisp. Now tell me, who could resist that? Spicy Pork Stir-fry (pad phet muu) from me. Didn't I say red curry paste was indispensable in the Thai pantry? Here it's used with Thai chili paste (naam prik pao, another Thai pantry must!) and/or fresh chilies. Again it's the Thai basil that really stands out. If you're a fan of Thai flavors and you like it spicy, this is the dish for you! 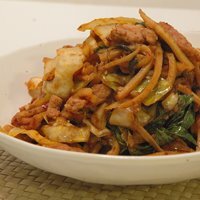 Thank you to all who participated in this round of Regional Recipes! I think we were able to show that delicious Thai food can be made at home. Where do we go from here? I know you're dying to know. Bust out your beret because we're going to FRANCE! The host this next round is Susan of Open mouth, insert fork. Please read the Regional Recipes guidelines and be sure to send submissions to Susan at susancarrier(at)sbcglobal(dot)net by January 15th. If you have participated in the past and would like to host a future round, please let me know and I will add you to the list. I had to snicker at the thought of wearing a beret. I haven't worn one since military training! A really nice roundup, Darlene. Can't wait for time to give all the recipes a really good read. Great roundup! I am sooo joining this challenge. I'm bummed that I missed Thai (my favorite), but I'll find something French for sure! Fabulous roundup Darlene. Thai cuisine is so beautiful. Your information is really helpful. My mom was a very good cook and she was so disappointed I wasn't interested. She said "Any girl would love the chance to learn from me but you don't even look!" I was a teenager and thought cooking defeated the purpose of grooming. I didn't want my hair and clothes to smell of cooking. Later, when I wanted to learn, she refused to teach me. So I taught myself from cookbooks. We never had Mother/Daughter togetherness in the kitchen. Great round-up. Much kudos to you for putting it all together. I especially liked how you further explained about Thai cuisine to educate us. Oh! I have a French recipe that's been sitting in my queue. This is a good chance to post it. 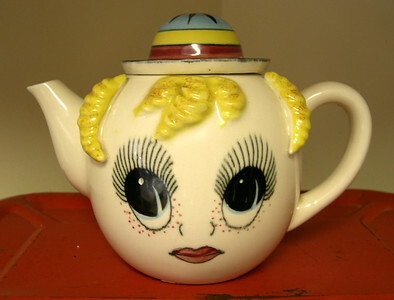 Thank you for hosting and thank you for a wonderful roundup. I love the pandan dishes: have to find pandan leaves soon. Thai cuisine seems really intimidating, even to Asians, like us! But it is such a treat learning about the different herbs and spices: all it took was one hit and I was in love! Thanks to everyone for their kind comments. I was really excited with the participation and submissions! 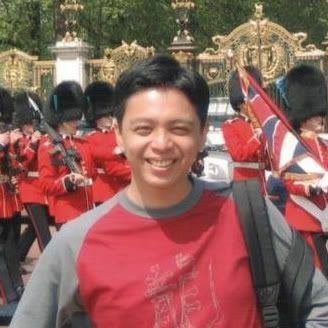 Mark, it can see you wearing a beret, but not a military uniform. Is military training required? KC, my mother and I differ on just about everything in life, even in the kitchen. I think she's just happy that one of her kids is interested in Thai food. My brother is more towards "American" food, which is a bit perplexing as mom never was much of a cook in that realm. WC, I hope it wasn't too remedial for anyone. I hope we've convinced people it is not very difficult to make at home. js, I was thinking the same thing about the pandan leaves. I haven't seen it here in Portland (although I haven't looked very hard), but maybe I can find it when I go visit my mom in Vegas. I did find an alcohol based pandan essence that can be used in sweets much like vanilla. 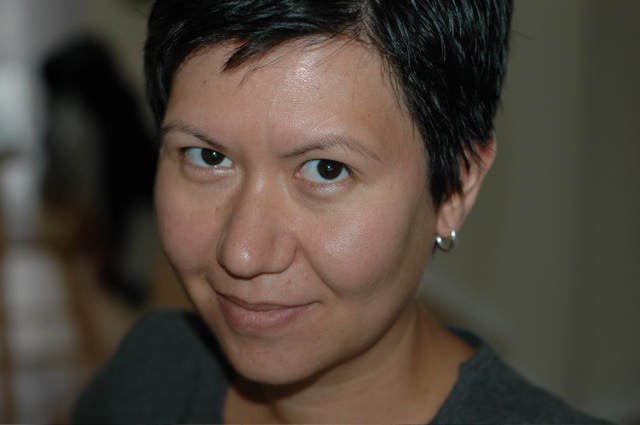 Who is doing your photography? They look amazing. I'm a photographer my self. Could you kindly share some setups you do to picture your food? 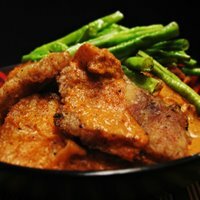 BTW I do the website for a restaurant here in MD, USA and have done their food pictures. Can we kindly exchange links? Charles, thanks for stopping by. I take the pictures myself. (For the round-up the bloggers took the pictures themselves). For me it's been a real learning process, and some of the good shots are more due to luck than anything. I tend to get luckier when there's a lot of natural light :-) You can check out my flickr page for info on the pictures, such as camera and settings. And feel free to link away. I too, buy Asian ingredients from Safeway, except Thai basil and chili that I have to buy at Asian market.